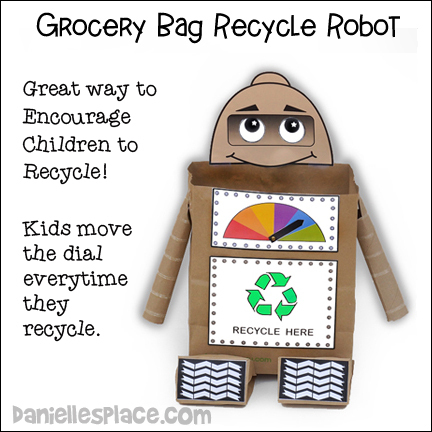 Use this little robot to encourage children to recycle their paper scraps. When they place a piece of paper into the bag they move the pointer on the dial towards green. 1. 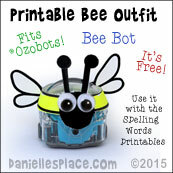 Print out the robot head pattern onto card stock that is close to the same color as your grocery bag. 3. Glue the white eyes over the eyes on the head pattern. Glue the head to the top, back of the grocery bag as shown in the picture. 4. Glue the meter and sign onto the front of the grocery bag. Punch a hole in the pointer for the dial with the brass fastener and then punch it through the meter pattern and grocery bag. Spread out the brass fastener inside the grocery bag. 5. Cut away half of the top part of the paper towel tubes and glue them to the sides of the grocery bag. Or you can just fold the top of the tube flat and glue it to the bag. 6. Cut out the feet treads and glue them to the bottom of the lunch bags. Stuff the bottom of the lunch bags with wrinkled up paper or plastic bags, and flatten out the top of the bags. Fold down the tops of the bags and tape them closed. Tape the paper bag "feet" to the bottom of the grocery bag as shown in the picture. 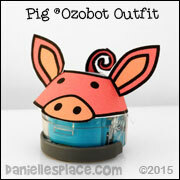 These adorable robots can be used as puppets, toys, or as party favors. Place candy or small toys in the eggs before placing them on the body. 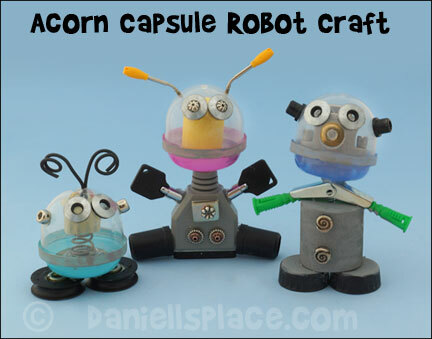 Use these robots for party favors by placing candy and small toys inside the tubes. 1. Cut the paper towel tube three inches high if you are using the 3" aluminum foil tape. If you are using aluminum foil, you can cut the tube any length you want. 2. Cover the paper towel tube with the aluminum tape or aluminum foil. 3. You can use the aluminum tape to tape the metal pieces onto your robot or glue them on with the low temperature glue gun. 4. Use a hole punch to punch holes in the tubes to insert screws, wires, and other objects and tape them to the inside of the tube. 5. The eggs used in this craft had two holes in them exactly where the antennae were placed so we didn't have to drill holes in the eggs. We just screwed the screws into the holes. If your eggs do not have holes, use a drill with a very small drill bit to drill the holes in the eggs. Drill the holes from the inside of the egg. 1. Cut a piece of card stock 3" x 11" and roll it up into a tube so that the bottom of the acorn capsule fits down into the tube. Tape the tube closed. 2. Cover the paper tube with the aluminum tape or aluminum foil. 3. 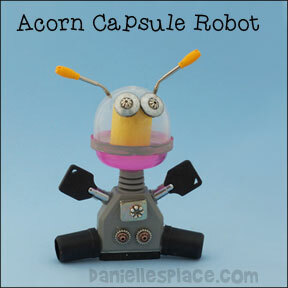 Open the acorn capsule and glue a foam marshmallow to the bottom of the acorn cap. 4. Glue on washer eyes and snap the capsule together. 5. 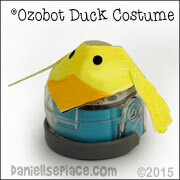 Tape or glue on other electronic or mechanical items to finish your robot. 6. 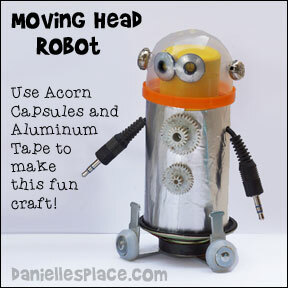 If you are using the robots as party favors, place candy inside the tubes and then set the heads on top of the tubes. This little robot's antennae and the inside part of the head was made with computer electrical parts. The wire was attached to the electrical cord. A hole was punched into the top of the 2" Empty Acorn Capsules using a sharp pair of scissors, and the wire was inserted through the hole from the inside and glued into place. Acorn capsules are made from pretty soft plastic so you can use a sharp pointed object without cracking them such as pointy scissors, a drill, or Dremel tool to make the holes. Washers with a Rubber Backing were glued on with a Low Temp Mini Glue Gun for the eyes. Two Metallic Pony Beads were used for the ears. The spring inside the capsule was a found object. Two wheels from a door closing assembly where painted black and glued to the bottom of the capsule for the feet. The edge around the acorn capsule cap was painted silver with acrylic paint. This robot was made from a computer electrical cord. The body is made with the end of the cord and the antennae were made from the screws from the end of another computer cord. The hands are keys glued on with a Low Temp Mini Glue Gun. 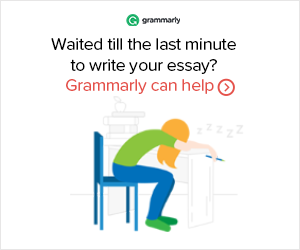 The legs are rubber caps. glued onto the center of the washers. The inside of the head is a Foam Marshmallow painted yellow with acrylic paint. 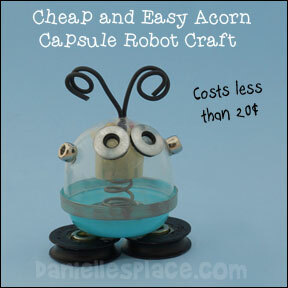 Metal Spacer Beads also decorate the front of the robot's body. The body of this robot was made from a foam rocket toy. The top of the rocket was cut off. A red dome shape from another toy was used for the head. Two googly eyes were glued to the dome shape. Two holes were drilled into the top of an acorn capsule and electrical wires were glued into the holes. Then the acorn top was glued to the head. The bottom of the robot was colored with a black sharpie marker. 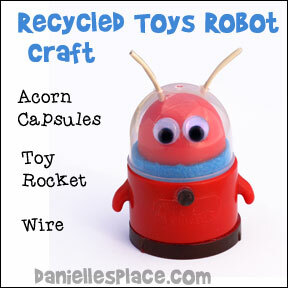 Reuse parts from your children's old toys to make robots. 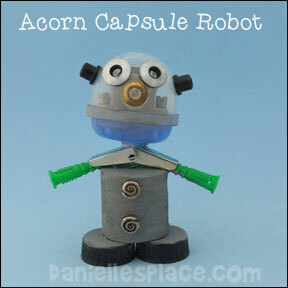 The head of this robot was made with the end of a computer electrical cord which was glued inside a plastic acorn capsule. The arms were made with a Toggle Bolt with the bolt removed and two plastic Wall Anchors. The body is made from a Foam Marshmallow painted grey with acrylic paint. Two silver beads are glued to the front of the body. The eyes are rubber-backed washers. The nose is a washer. The ears are rubber screw caps. The feet are caps from gallon milk jugs painted black on the sides and grey on the top and glued to the marshmallow body with Low Temp Mini Glue Gun. 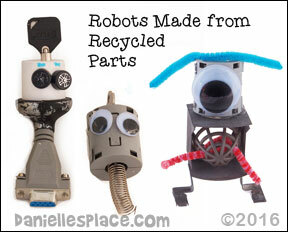 See below for kid-tested robots made from recycled parts. 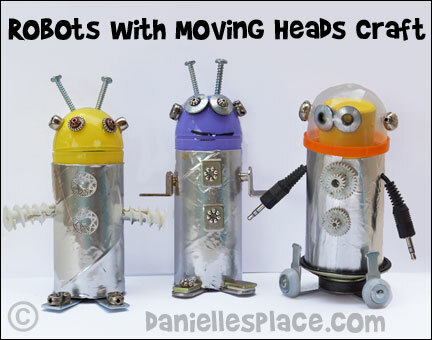 Solan, an eleven-year-old made these adorable robots from miscellaneous parts and various craft supplies. They were glued together with a low temperature glue gun. Parts include: electronics, old television parts, the ends of computer cables, and springs and wheels from old toys. Note: Close supervision is essential when crafting with children. An adult should always be present when children are using glue guns and other potentially dangerous equipment. 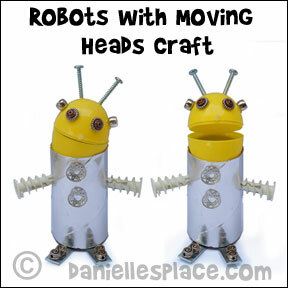 Planetpals - Plantpals has hundreds or recycled craft ideas and links to other websites with recycled crafts for kids.